PARIS (Reuters) – About 20 companies including Unilever, EDF and Iberdrola joined an international alliance of 26 nations on Tuesday pledging to phase out coal to combat global warming. At a climate summit hosted by French President Emmanuel Macron in Paris, new members of the "Powering Past Coal Alliance" agreed that traditional coal power should be phased out by 2030 in rich nations and by 2050 in other parts of the world. The coal phase-out plan, launched last month by about 20 governments, widened on Tuesday to companies also including BT , Engie , Kering, Diageo, Marks & Spencer, Orsted , Storebrand and Virgin Group. Nations including Sweden, Ethiopia and Latvia, as well as the U.S. state of California, also joined the alliance as part of commitments under the 195-nation Paris climate agreement reached on December 12 two years ago. The companies committed to setting targets to end the use of traditional coal from the power sector, both for consumption and in generating electricity. Coal could play a continued role, for instance, if greenhouse gas emissions were captured and buried. A declaration said that coal-fired power plants produce almost 40 percent of global electricity. Most of the countries in the alliance are already cutting their use of coal and big coal users, such as China, India, the United States, Germany and Russia have not joined. U.S. President Donald Trump plans to pull out of the Paris Agreement. He doubts that climate change is caused by man-made greenhouse gases and wants to bolster the U.S. coal and oil industries. So let’s have a look at some of the companies quoted. I was not particularly aware that BT, Unilever, M&S, Virgin and co actually used coal for anything directly. It would be interesting though to ask them if they would like to reduce their electricity consumption by the amount that coal is contributing to the grid each day, (today it is running at 16%). But what about energy giants EDF and Iberdrola? In France, coal fired power is virtually insignificant, at just 1.3% last year. Two of the four coal plants there are owned by EDF, but will not last much longer, given the French Government’s decision to close them down. Interestingly it was reported in 2015 that EDF wanted to keep the coal plants at Cordemais and Le Havre open until 2035, at odds with the official state policy. Now it appears that EDF want to take the credit for a policy imposed on them anyway. In the UK, EDF own two coal plants, Cottam and West Burton. Again government policy is to shut these by 2025. The rest of EDF’s output in Britain and France is, of course, based around nuclear, renewables and gas, all of which stand to benefit enormously from the demise of coal. The Spanish company Iberdrola is in a very similar situation. Currently coal power is supplying just 1.6% of total generation. Ironically Iberdrola announced last month that it was closing its last two coal power stations in Spain because of overcapacity, but the government blocked the decision because of fears over energy security! As with EDF, it appears that Iberdrola are pulling out of their very small coal assets because of commercial reasons. But what about the three countries mentioned. In Sweden, nuclear and hydro power account for 81% of generation, whilst fossil fuels only supply 1%, all of which is gas or oil. Note that Sweden is not planning to stop using coal completely, only for producing electricity. Without beating about the bush, Sweden’s declaration is totally fraudulent, as they are using no coal at all for electricity generation in the first place. And Latvia’s position is pretty much the same. Apart from one tiny 20MW coal/biomass co-generation, they also have no coal power generation. Needless to say, Ethiopia also have no coal capacity either. Nearly all of their power comes from hydro. None of these new members of the "Powering Past Coal Alliance” will make the slightest difference, as they either do not use coal, or are already phasing it out anyway. FRANKFURT, Dec 7 (Reuters) – German utility Uniper will start up its Datteln IV hard-coal fired power station in the fourth quarter of 2018, it said in slides for an analyst and investor call on Thursday, having previously planned to start it in the first half 2018. The 1,050 megawatts plant in western Germany has been held up for years by intense legal battles with environmentalists as Germany seeks to move away from coal-fired electricity long-term. ← Macron Saves The World! 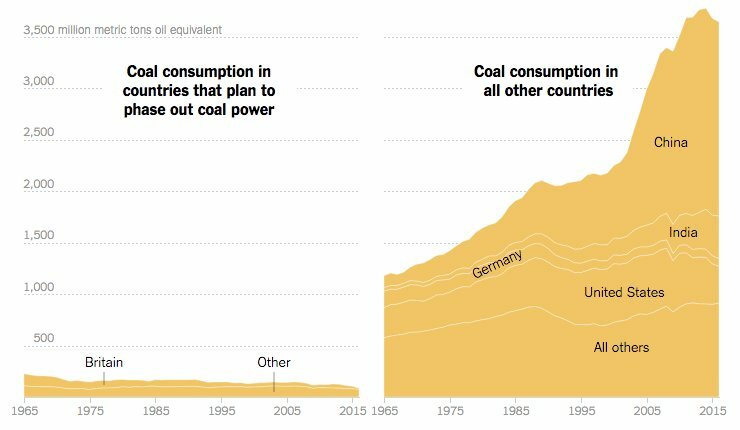 Coal consumption in countries that are phasing out coal, vs those are NOT. The countries phasing coal out, is a very small minority of usage. Please can you provide a citation so that I can understand where this graph comes from. Washington State is also a polity that practices virtue signaling. About 1990 we drove through a small town, named Zillah, in central Washington State. At the edge of town was a large sign offering coal for domestic heating. Today, Washington State does have some “thermal” power — waste wood/paper scraps and landfill gas. The big utility in the State imports electric power** from coal. Politicians want WA to be “coal-less” but haven’t figured out how to do that. Real soon now, though. Expect cost to consumers to go up. **That plant has issues because of multiple owners and the operator (a partial owner) wants out. That company doesn’t have the right sort of contracts for its sales compared to its co-owners. Some of these things are so complex they cannot be explained in fewer than 10 pages. For all the good it will do them in the eyes of the green Luddites. The major issue is that this is par of the relentless brainwashing campaign by the “Green-blob”. The implication that major companies and countries are abandoning coal is all that they want to get over. It is a truly terrifying media control that allows such dishonesty to go unchallenged: ITV news last night had a similar report about saving us all from climate change and the set narrowly survived. Big brother certainly rules now. TPTB caused the problem, the solution could only mean more micromanaging control, it is hard, in fact very hard not to consider that, creating energy outages is a desired outcome and limiting and rationing supply is a very malicious but effective way of cowing the population and then of course others would say that children who play with matches always get hurt. Who knows what may happen, I can’t say I desire it, but the portents are not rosy – at all. My God! The Chinese must be loving this. The West is giving in without a fight. Last recorded Quarter Q2 2017 coal was contributing less than 2% (for the whole of 2016 coal was 8.6%. please download the data set and do your own calculation. I worked in power cost management in a major corporation for 20+ years. I can tell you for a fact that upper management hasn’t the slightest idea where their electricity comes from.